A bright bag will instantly update your look especially if you are one who tends to wear a lot of black or neutral colors. It will give your look that extra punch that says "look at me, I'm modern!" Photo on the above right is the Reed Krakoff boxer tote. And if you are like me you are probably used to wearing a cool kitten heel boot like the model on the left. I was at the grocery store tonight and I saw a girl wearing a pair of wedge boots like these ones on the right by DKNY and I thought wow, how cool! Just slightly different yet still the same because it's still a boot. I could do this! And you could too. If you don't ever wear a boot like either of the ones pictured here, maybe you try either one in order to break out of your clothing rut. Once you start walking down the street in one of these, trust me, you will feel so free! Try a fresh new make up look. 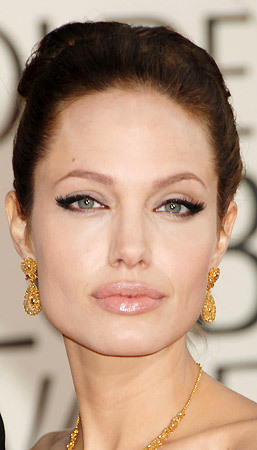 I feel that the cat eye and and the red lip are two of the freshest and most modern make up looks of right now. When trying the cat eye make up look just apply eyeliner on the UPPER LID ONLY, while making a thicker line as you get to the outer corner of the eye and wing it up. Try smudging it if it is a little too extreme. Don't be afraid of making a mistake. I tend to use a q tip to tame my cat eye. It takes a little practice to get the line down pat, but with a little practice you will be a pro. The cat eye also requires black mascara. Concentrate the mascara towards the outer part of the eye. Sometimes I line the lower lashes (the outer corner only like my girl Angelina here) or sometimes I skip the lower lash line all together if I want something more subtle. However, I never use an actual eyeliner pencil on my lower lash line. I always use a powder eye shadow with a precision brush to achieve a less severe look. 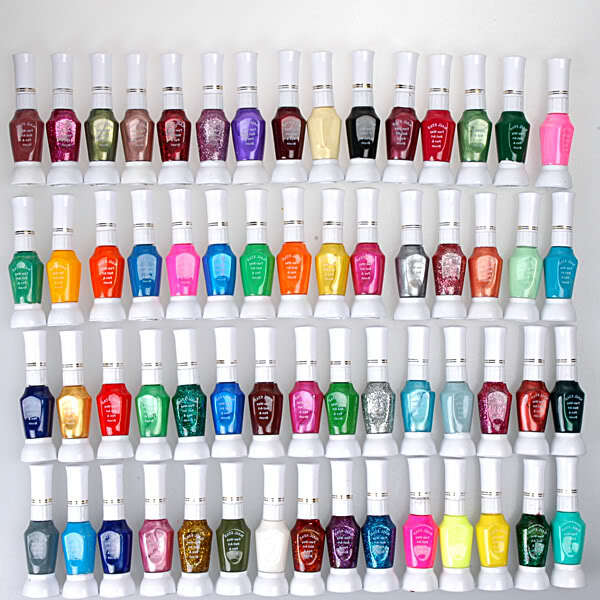 Experiment with a new nail color that you have never tried before. It will give you a new outlook and set you free! One of the most important aspects of looking cool, current and modern is your hairstyle. Think back to how long you have been wearing the same hairstyle. Has it been longer than 2 years?? It's definitely time for a change. Your hairstyle is the base or the root of your overall look. If you have long hair and you don't want to cut it, try styling it different. I LOVE Fashionising.com. 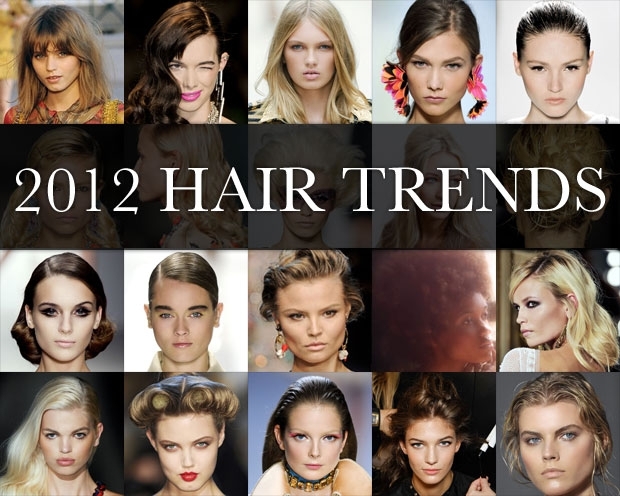 This is a great website that will update you on everything from the hottest hairstyles to fashion trends of the moment. Fashionising will keep you in the fashion loop. Check it out weekly. My stylist (Hi Charlene!) changes up my look just ever so slightly every time I visit her so that I stay current. The photo on the right was taken about 2 yrs ago when I was a "blonde." Can you imagine how bored I would be if I was still doing the blonde thing now? The photo on the right was just taken yesterday. As you can see a hairstyle change can make a world of difference in your look. Finding a stylist who "gets" this concept may be a challenge, but once you do you will be grateful. Look at these four lady celebrities. Why do you think they have been named a few of the best dressed? (Besides the fact that they have their own personal stylist.) They don't look dated. They change their look up from time to time so that we won't get bored of looking at them. We have to see ourselves every day in the mirror as we get ready for work for the same job at the same time every day. Why not make this process a little bit fun?! Change it up! Experimenting is the key. You will never know what might look fabulous if you don't keep trying. You are worth the effort! Trust me! 1) Try new accessories in unexpected colors. Think BOLD accessories. But don't over accessorize. Minimal and bold. Two words to keep in your head when buying accessories. Wear a great necklace and skip earrings or just wear a tiny stud. Wear a bold pair of earrings and skip the necklace. Sometimes a great bracelet is all you need! 2) If you normally wear a heel try a flat or oxford. If you normally wear a flat try a heel! 3) Try a new make up technique. 5) Change your hair style every few months to keep your look current. 6) Keep Fashionising.com in your favorites. 7) The most important points to breaking out of your clothing rut is to always keep and open mind and experiment. If you don't do those two things you will be stuck in your rut forever! As George Costanza says, do the opposite of what you normally do! This will keep you from being stuck in your own rut. (I love this Seinfeld episode. But what one don't I love?!! Great ideas that can be easily accomplished for a fresh look. Thanks! Love some of these ideas! Off to shop for a color pop purse!